Stormwater management facility sites are generally a best management practice integrated throughout land development projects, which provide for a volume of water storage, infiltration and evaporation that mimics the natural rate of runoff or groundwater recharge. The sites (i.e., size, location and depth) must be designed and constructed according to all applicable ordinances and under the direction of a qualified design professional. In addition to planting trees and shrubs, seeding with native plant species is an economical way of vegetating stormwater management sites. Erosion control fabric, mulch or hydro mulch is necessary to control erosion both during and after construction. Examples include detention basins (temporarily impounds run-off water, allowing for release at controlled rates), retention basins (stormwater management facilities with permanent impoundment or pool for improving water quality) or bioretention basins and rain gardens (dynamic, living microbiological systems that enhance retention, infiltration and evaporation of run-off water while remaining attractive to wildlife). 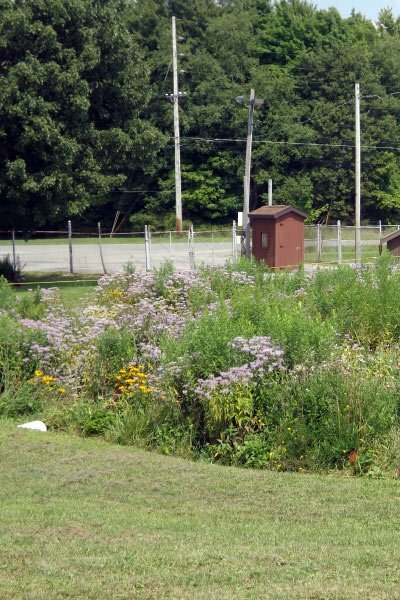 In all stormwater management facilities, plants prevent erosion and slow water movement, hold or convert pollutants, enhance infiltration and evapotranspiration and encourage wildlife. Plant species or mixes can be selected that meet the critical objectives and extreme conditions that plants must have to survive. 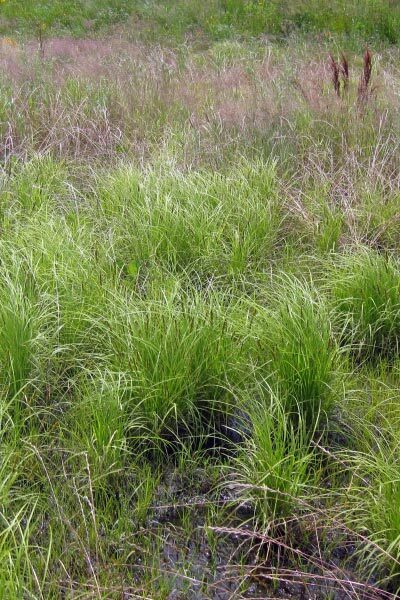 Native grasses produce fibrous root systems that tolerate fast-moving water. Woody and herbaceous species add aesthetics, provide wildlife food and habitat and assist with evapotranspiration while preventing erosion. rain garden mix is appropriate. Seeding and planting should begin immediately upon completion of the structure while the soil is still friable and before invasive weeds emerge. Plan seeding and planting before the basin is flooded or allow the basin to drain to a few inches before seeding. Broadcast seed evenly over each unit by hand seeding or hydroseeding. Seeding rates are generally low (1/2 lb per 1,000 sq ft). A bulking agent (such as kitty litter) may be used to create a mix of 10 lb per 1,000 sq ft (i.e., 9-1/2 lb of bulking agent mixed with 1/2 lb of seed), which can be broadcast seeded evenly over the area. Invasive species, particularly those that will adapt to wet conditions, should be removed or sprayed with an approved herbicide before becoming incorporated into the site. Perennial weeds not addressed before establishment will be difficult to remove later. Normal vegetation can be worked into the topsoil, which should be stockpiled until the final grade has been established. With the specifications and dimensions, on-site construction of the berm and outlets must be executed carefully to maintain structural integrity. The infiltration and plant growth areas should be loose and friable, high in organic matter and completed without compaction from heavy equipment. By using the “dig and drop” method¹, one can use an excavator to dig and drop each area of the bottom soil in a loose manner. At this point, lime, composted leaves and/or grass clippings can be incorporated. The excavation machine does not move over the finished surface, thus avoiding unnecessary compaction. Native vegetation can be planted or seeded over this uneven absorbent surface. Oats or rye can provide temporary vegetation to protect the soil until permanent vegetation can be established. The use of such native species as Elymus virginicus (Virginia Wild rye) can create an intermediate cover that succeeds in long-term native vegetation. Straw mulch or straw coconut mats are frequently used to control erosion and protect emerging seedlings from extreme temperatures and drying out. Mulch should be sparse in order to allow sunlight to reach the ground. 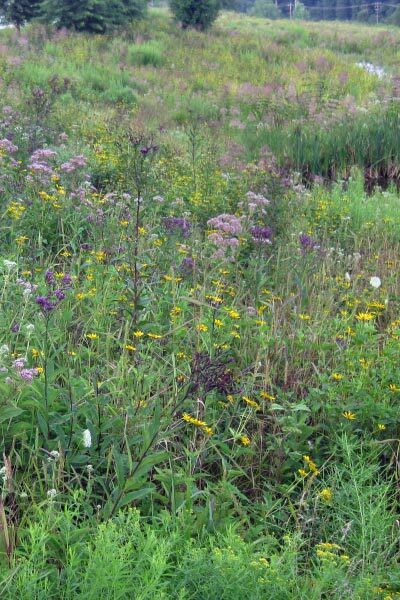 If the site is a retention basin, refer to the Wet Meadow & Wetlands Planting Guide. Transplanted seedlings and shrubs may need temporary water until they become well rooted. Irrigating seeded areas is beneficial until seedlings become established. 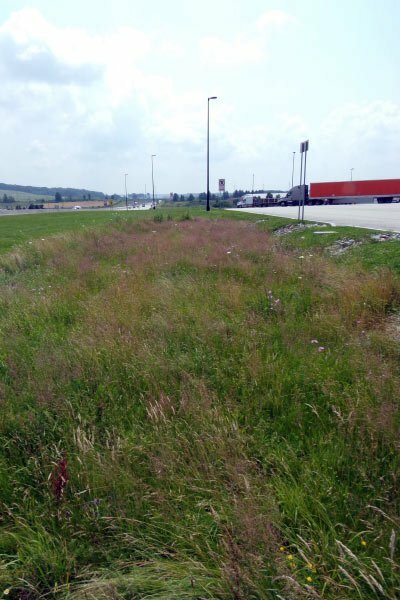 Whenever canopy (overall vegetation) reaches a height of 18”-24”, use a brush hog mower or string trimmer to trim the meadow to a height of 8” (Note: A lawn mower is not recommended as the mower height will be too low and native seedlings will be killed). This will reduce competition by fast-growing weeds for sunlight, water and nutrients needed by slow-growing perennial natives. If bioengineering or containerized woody materials are used on the site, mowing should be above the new growth of these materials. Mowing should cease by mid-September. Problem weeds should be hand pulled or spot sprayed with an approved herbicide (such as Rodeo®). trim any material standing from the previous year close to the ground (approximately 2”). This will allow the soil to warm more quickly, which will stimulate the emergence and growth of native seedlings. It will also reduce the likelihood of the meadow being invaded by shrubs. If bioengineering or containerized woody materials were used on the site or seed of shrubs/trees were part of the mix, the site should not be trimmed after the establishment year. Problem weeds should be hand pulled or spot-sprayed. If you notice a heavy infestation of ragweed or foxtail in the second growing season, trim the meadow to a height of 8”. If bioengineering or containerized woody materials were used, trimming should be above or around new growth of the plants. Trimming should cease after mid-September. In addition to structural maintenance, siltation needs to be removed as needed. Close mowing or extensive chemical use is not conducive to water quality improvement and wildlife habitat. The following mixes are used to address stormwater.